Every dream has a price. Every choice has a consequence. Every win comes from a sacrifice. Watch Episode 1 of Arré’s new show, Official Chukyagiri on September 7. There’s a cute intern in town. 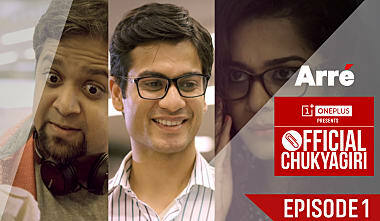 Catch the trailer of Arré’s NEW show, Official Chukyagiri, coming to you, Monday, August 22. Say hello to Spandan Chukya - INTERN OF THE YEAR in our new show Official Chukyagiri. Trailer out tomorrow. On his long journey from Meerut to Mumbai, Spandan Chukya sings, ‘Adab se pesh aa zindagi’. Watch the season Premiere of Official Chukyagiri presented by OnePlus on September 7. Mithila Palkar, Anand Tiwari, Aahana Kumra and Gopal Datt have some tips for interns. Episode 2 of Official Chukyagiri goes live Wednesday, September 21. Mithila Palkar, our very own Mili from OnePlus presents Official Chukyagiri doesn’t have just one Never Settle Moment. Anand Tiwari, a.k.a. Ganesh from Official Chukyagiri quit medical school to pursue his career in acting. And that, is his Never Settle Moment. What's yours ? How to do it right? - Janitor chacha ke ishq wale funde. Your wish is our command. Here’s the Official Chukyagiri audio jukebox! Enjoy ? Sunny Kaushal aka Spandan Chukya has a surprise in store for his fan, an Ola cabs driver.